Many music lovers will, I believe, admit that they learned to love opera by listening to Puccini. Some of us might move away from him, even scorn him. Then with luck, we come back, listen with fresh ears and appreciate his strengths all the more - and we grow to love him all over again. A recent biographer of Puccini astutely remarked: "The ability to write a good tune may be no guarantee of greatness. But the ability to write a good tune and then to place it seemingly effortlessly in the context of a work that is beautifully crafted, unerringly paced and precisely coloured is a token of genius that should never be underestimated." A distinguished critic once observed that opera houses need Puccini the way farms need dung. The quip was less insulting than it sounded for without La Bohème, Tosca and Madama Butterfly as a permanent part of their repertoire, most opera companies would be in penury. These works are the fertilisers that enable the music of composers, less popular than Puccini, to survive today's financial rigours. Before Puccini set to work on La Bohème, there was a violent ending of his friendship with his fellow composer Ruggero Leoncavallo who had been planning to write a version of La Bohème himself. (Leoncavallo actually did complete his opera but it is totally overshadowed by the Puccini composition, which was completed first). It also, in La Bohème, inspired him to produce the most perfectly structured of all his operas, the one in which choice of subject, choice of librettists, and the musical approach all merged to create a masterpiece. The five librettists of Manon Lescaut were reduced to the two who mattered for La Bohème - Giuseppe Giacosa and Luigi Illica. Illica was to write the scenario and Giacosa was to versify it but they both had to contend with Puccini's volatile temperament and his continual interference and constant text and structural changes. Giacosa protested that one scene had had to be rewritten a hundred times and threatened to resign. A whole act was sacrificed because Puccini thought, quite rightly, that it added nothing significant to, and even lessened the impact of the drama and interrupted its flow. And so La Bohème took three years to complete, "compared with the three weeks a Mozart might have needed for it". 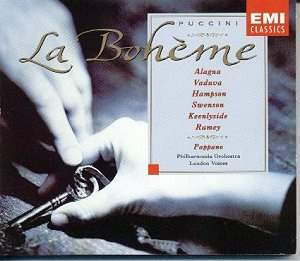 La Bohème is perfectly balanced; Acts I and II mirror-image Acts III and IV. Act I begins with Rodolfo and Marcello bantering in their studio before Schaunard and Colline arrive and concludes with the beginnings of the love affair between Mimi and Rodolfo. Act IV opens with the same two artists in the same studio before the entrance of Colline and Schaunard (again bringing in food) and concludes with the end of Mimi and Rodolfo's love as the poor girl dies. Act II begins with the crowds in front of the Café Momus and concentrates on Mimi's growing passion for Rodolfo (but hints at the latter's jealous disposition) and introduces Musetta who appears with her wealthy old protector and successfully provokes Marcello's jealousy so that he takes her back. Act III also begins outside (in front of one of the gates to Paris and near the inn where Marcello is painting) with a busy-ish crowd scene. It covers the rift in the relationship between Mimi and Rodolfo and a parallel rift between Marcello and Musetta. Even little details are mirrored. In Act I Schaunard explains that his "windfall" comes from a wealthy Englishman who had wanted a musician to play to his dying parrot. In Act IV when the artists are indulging in horse-play, Rodolfo asks of Marcello, "Which do you choose, Baron, salmon or trout?" to which, Marcello replies, "Well, Duke, how about some parrot-tongue?" In Bohème the music is the action, and the action is the music, in a manner new to opera. That is what makes the vividly exact musical depiction of every incident in Act II unique in operatic history. Here is music in which time is not frozen in the manner it usually has to be in opera. Even the orchestral part, like the singing, is made to sound conversational in a fresh way, without sacrificing the beauty of either instrumental or vocal tone. Nobody - except Puccini himself at one point in Act III of Manon Lescaut - had done anything quite like it before in Italian opera, and nobody would do it so successfully again." 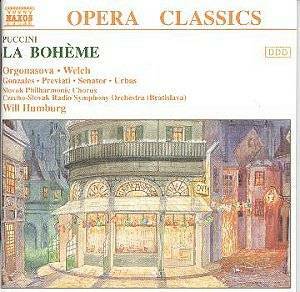 Puccini's graphic music and brilliant orchestration for Bohème is noticeable throughout the opera. I would mention just one example - right at the beginning of the opera when Rodolfo and Marcello are shivering in their studio - you can feel the chill in the air with them; and when Rodolfo burns his manuscript you can hear the fire take hold, flare and crackle, and ultimately die down and extinguish. In conclusion of this section, I would quote Wilson once again as he reminds us: "
Nowhere else did Puccini give one of his operas such a recognisably and consistently symphonic shape. Leonard Bernstein had good reason to select Act III of La Bohème as his favourite example of 'what music does to expand mere drama into opera'. Using it as the basis of a television lecture, he showed how successfully Puccini expanded the emotion of the words, how the change of one single note in a repeated phrase could heighten the drama, and how two, three or four characters singing simultaneously could create a network of emotions that was in itself a new kind of emotional experience - and one of a sort that only great opera can achieve. 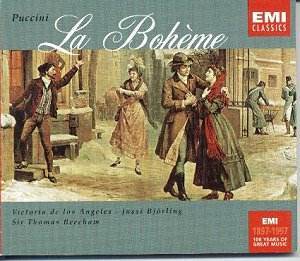 The classic Beecham recording of La Bohème was something of a miracle. It was organised at the very last minute when Beecham's manager, Andrew Schulhof, realised that Victoria de los Angeles, Jussi Björling and Beecham himself would all be in New York in the spring of 1956 and persuaded EMI and its then-associate American company RCA to record the opera. Edward Greenfield, in writing the notes for this set recalled, "The sessions began on March 16 and 17 and were completed in an intensive rush of activity between March 30 and April 6 with only one day (April 4) left free of sessions. Legend has it that Victoria de los Angeles stopped off on her way to the airport, to make her final contribution to a recording that tingles with life and warmth from beginning to end." Greenfield goes on to remind us that Beecham had met Puccini and had had first hand experience of the volatile composer's interference in the production of his own operas. Beecham never liked Puccini too well. Puccini had brushed Beecham aside when in 1904 the young conductor first met him after an approach through Illica, to discuss Beecham's own opera on the subject of Christopher Marlow. Then, in 1920, when Beecham was established, he clashed again with Puccini over the set for a Covent Garden performance of Suor Angelica. Greenfield adds, "What Beecham did not mention there - though one has to assume that it equally reflects his discussions with the composer - is that his speeds are almost always markedly slower than those of Toscanini, who at that time, was by far the greatest Italian conductor of the day and the conductor of Bohème at its Turin premiere in 1896, tended to be counted authoritative in his views. Over the years, since Beecham made this recording, not long after Toscanini had made his at a live concert performance, also in New York, the views of Beecham on tempi in this opera are the ones that have tended to prevail and understandably so. The music itself blossoms the more. 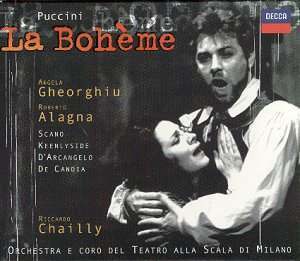 We pass now from the oldest recording in this survey to the most recent - that of Riccardo Chailly who uses the new critical edition of La Bohème produced by Francesco Degrada in 1988. In a fascinating interview with the conductor, reproduced in the set's booklet, Chailly reveals that Degrada's edition contains no less than 181 amendments to the published score - 42 in the first act, 52 in the second, 39 in the third and 48 in the fourth - all concerned with regularising all the vagueness and ill judged practices that had accumulated from performances over the years. Only three of these, however, affect the actual notes in the score, the most striking of them being the addition of a rising flute line set against the harp notes just after Rodolfo begins "Che gelida manina".
!" Puccini liked to have a sense of tempos pressing ahead. The first part of the first act, like the first part of the fourth, has to move with a youthful freshness without any sentimental lingering." Musetta's waltz-song should be brisk and not sentimentalised "if it sounds like something from an operetta, it's the performance that is to blame"
This interview/article makes absorbing reading and I recommend that it is not passed over when this set is purchased. The opera is set in the Latin Quarter of Paris, commencing on Christmas Eve, 1830 - revolution had occurred in the City in the July of that year. Official provision against hunger and destitution had been inadequate throughout the 1820s. Act I - the artists' studio. There follows the famous arias and duet as they introduce each other and fall in love. Jussi Björling makes a fine virile Rodolfo. What superb artistry and voice, pleasing youthful timbre, perfect control and natural expressiveness. Pavarotti, in great form, delivers all one would expect of him. He might, however, be thought overly dramatic for some tastes. As good as Roberto Alagna is in the newer recordings - especially, and understandably, with his wife Angela Gheorghiu - he is overshadowed by these two giants. Victoria de los Angeles's Mimi is simply ravishing. Her phrasing and sense of line is immaculate and how she can tug at the heart strings! How the New York critic could have dismissed her Mimi as dispassionate and sexless is beyond my comprehension. Mirella Freni is also very impressive, subtle yet passionate with a silken vocal line and her duet with Pavarotti is shattering. Pappano's Mimi, Leontina Vaduva, is not so beguiling, her diction woolly and the curve of her vocal line not so pleasing. Gheorghiu impresses more and she and Alagna deliver another thrilling climactic duet. Both Beecham and Karajan's readings are slower than both Pappano and Chailly. I have to say I prefer Beecham's approach; and Karajan's keen sense of theatre always thrills. The sound on the Pappano recording is a bit recessed, so the playing volume needs to be compensated accordingly. All the conductors provide warm and sympathetic accompaniments for the singers with Beecham and Chailly adding little extra felicities and Karajan's Berlin orchestra adding that bit more intensity and passion, and their playing is simply glorious. The early part of this act, brimming with activity and colour with the crowds, the street vendors, urchins, students and toy seller belongs to Karajan who again demonstrates an acute sense of theatre. Karajan's children's chorus is outstanding and the Berlin strings give opulent support to the growing affection between Rodolfo and Mimi. As Mimi and the bohemians sit outside the Café Momus, Musetta appears on the arm of her elderly admirer Alcindoro. She immediately sets out to make her former lover, Marcello jealous by singing her famous waltz-song. Of all the Musettas, I favour Elizabeth Harwood on Karajan's recording. 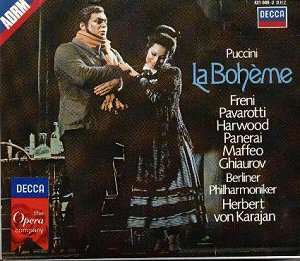 Harwood, I felt, was often undervalued, and in this role she is excellent - saucy and coquettish with Karajan accompanying superbly; and she is really waspish in her subsequent vitriolic exchanges with the irate Marcello (a staunch Rolando Panera on this recording). The quartet with Rodolfo and Mimi expressing love (but Rodolfo beginning to show his jealousy) and the bitter exchanges between Marcello and Musetta is very successful and vivid on the Beecham and Chailly recordings. Karajan's passing military tattoo is brilliant theatre; and the, act of course, ends with the two sets of lovers together - but for how long? Act III At the Barrière d'Enfer, one of the toll gates of Paris, on an early morning in February. There is a tavern on the left where Marcello's signboard is hung. Snow lies on the ground. People wait to be admitted to the City, while customs officials doze around a brazier. Beecham captures this scene brilliantly. The chill evoked by the RCA Victor Orchestra is palpable, so too is the contrasting warmth from the brazier. Sounds of hilarity come from the tavern as Mimi enters weak and coughing. Marcello comes out of the tavern and sees her and asks her if she will join them. But Mimi tells him of Rodolfo's unreasoning jealousy and that she fears that they must part. Rodolfo emerges from the tavern as Mimi hides behind a tree. He first complains to Marcello about Mimi's being something of a coquette but then reveals the truth - his fear that she is dying. A cough gives Mimi away and she and Rodolfo agree to part but then feel it is better to stay together through the hard winter and then, perhaps, part in the Spring. As they draw closer, Marcello who had been experiencing better relations with Musetta now thinks she is up to her old tricks again flirting in the inn and so they fall out again. This dramatic switch occurs in the quartet that so impressed Leonard Bernstein (see the end paragraph of the opening discussion of this opera). Robert Merrill's Marcello on the Beecham set is strong and understanding in his exchanges with Mimi and vituperative with Musetta - the sparks really fly. Simon Keenlyside as Marcello on the Chailly set and Thomas Hampson impress too (the dependable Hampson is consistently good) on the Pappano recording. Victoria de los Angeles brings a lump to the throat with her heart-rending goodbye to Rodolfo and Björling is very natural and convincing in his expressions of jealousy, remorse, concern and love. Pappano delivers a warmly sympathetic third act accompaniment and again the exchanges between Rodolfo and Mimi are natural and sympathetic. The quartet goes to Beecham and Chailly; and, at this point, I must praise the singing of a nicely youthful-sounding Elisabetta Scano as Musetta. Marcello and Rodolfo are now separated from Musetta and Mimi. They try to work but memories of their girls keep intruding. Colline and Schaunard enter with a meagre meal which is eaten with mock solemnity and some horse-play follows. Suddenly Musetta appears at the door. She tells them Mimi is outside but is too weak to climb the stairs. Rodolfo rushes down to help her while the others prepare a bed for her. Musetta gives Marcello her earrings to buy medicine and cover the cost of a doctor. She then decides to go with Marcello to buy a muff for Mimi. Colline chooses to help by pawning his overcoat and he leaves with Schaunard. Mimi and Rodolfo keft alone reminisce over their romance and we learn that Mimi was quite aware of Rodolfo's amorous tactics when they first met. The others return and as Mimi drifts off into her final sleep Musetta kneels and prays for her. Rodolfo slowly realises from the atmosphere in the room what the others had already understood that Mimi is dead. The curtain falls on his cry of anguish. Beecham's and Karajan's readings of the early part of the act are high-spirited; and their lovers' final duets are most moving. Nicolai Ghiaurov on the Karajan set is particularly appealing as the otherwise stoical Colline as he decides to bid farewell to his treasured overcoat. Pappano's artists shine in this final act too. There is delicacy and subtlety of shading in the opening exchanges between Marcello (Hampson is very good here) and Rodolfo as they reminisce about their estranged loves at the beginning of the act. Pappano also adds little telling touches like the sinister turns of phrase when Colline explains that he is summoned by the king (Louis Phillipe) to the ministry and some plot might be afoot. Chailly's recording is distinguished by a most moving final duet by Gheorghiu and Alagna. Ildebrando D'Arcangelo's Colline impresses too. Naxos prove once again that you don't need to have big star names to deliver fine performances. Under Humburg's direction, the Czecho-Slovak Radio Symphony Orchestra is magnificent; wonderfully expressive, polished, refined with immaculate phrasing and nicely judged rubato. Carmen Gonzales is a really coquettish Musetta equalling Elizabeth Harwood on the Karajan set in appeal. Her Marcello (Fabio Previati) is equally impressive; volatile and articulate. While Jonathan Welch as Rodolfo does not have such an appealing timbre as Pavarotti or Björling (he has a slight tremolo and is a trifle nasally), he is, nevertheless, ardent and passionate enough; and his Act III and IV duets with Orgonasova are heart-rending. Luba Orgonasova cannot really compete with the divas of the full price versions either. Like Welch, her timbre is not so appealing - sometimes sounding suitably girlish but at other points in her register, she seems a little, dare I say it, matronly, and certainly too full-toned to sound consumptive. Yet she sings confidently and is sensitive to all the emotional shades of her role. Unsurprisingly, for a super-budget release the documentation is not so full, the libretto comes in Italian only. All in all, and taking the low price into consideration, I unhesitatingly recommend this set as alternative listening to any of the full priced recordings reviewed above. It was a fascinating experience listening to these four performances one after another, act by act. After the older two recordings, of Beecham and Karajan, the newer two seemed to be something of a disappointment yet there is much to admire in both of them particularly Chailly's recording. I rank Beecham and Karajan in joint first place and say that I would favour each depending on my mood. If I wanted a more natural, slightly more restrained yet moving reading I would go for Beecham - if I needed more passion and a really sumptuous and theatrical account then I would have to plump for Karajan. If I was sent to a desert island and told I could only have one recording, then it would have to be Beecham. Of the two newer recordings, my money goes on the Chailly version. I will conclude by quoting, once again from Conrad Wilson, When Puccini completed La Bohème in his study at midnight on 10 December 1895, three years after he had begun it, he burst into tears, so great was his own emotion. Sentimental though it may seem, it was the death of Mimi that did it to him. The man who has often been accused of 'manipulating' his audience clearly found it easy to manipulate his own emotions, to the extent that, on finishing Bohème, he admitted that he had - 'had to get up and, standing in the middle of the study, alone in the silence of the night, I began to weep like a child. It was as though I had seen my own child die.'"